Rwanda is in the African Great Lakes region and is highly elevated by its geography is dominated by mountains in the west and savannah to the east, with numerous lakes throughout the country. Located a few degrees south of the Equator, Rwanda is bordered by Uganda to the North, Tanzania to the East, Burundi to the south and the Democratic Republic of Congo to the west. Rwanda lays a few degrees south of the Equator and landlocked. The capital, Kigali is located near the centre of Rwanda. A largely undiscovered Eden, she promises unrivalled biodiversity, dramatic mountains and volcanoes, some of the oldest and most precious rain forest on earth, a glittering skein of lakes, rivers and waterfalls and three stunning national parks. As to wildlife, Rwanda boasts 13 species of primates 25% of Africa’s total and remarkable 670 species of birds, many of which are globally endangered. The high altitude of Rwanda provides the country with a pleasant tropical highland climate with a mean daily temperature range of less temperature. Temperatures vary considerably from region to region because of the variations in altitude. Rain is heaviest in the southwest and lightest in the east. A long rain season lasts from February to May and a short one from November through December. 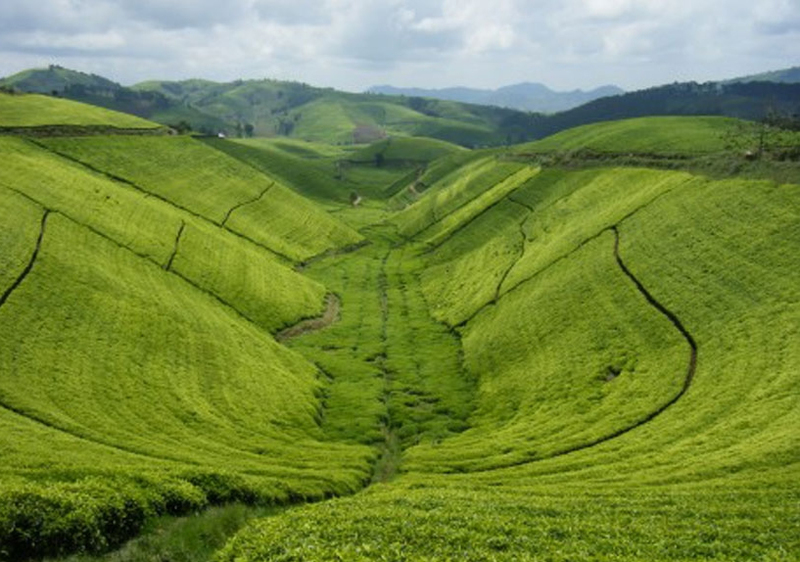 When it comes to flora, most of Rwanda is a region of savannah grassland. There is little forest left; the country is one of the most eroded and deforested in all of tropical Africa. Remaining woodlands are small areas of tropical forests along the western border, north and south of Lake Kivu. With it comes to Fauna, wildlife was abundant before the region became agricultural. There are still elephant, hippopotamuses, buffaloes, cheetahs, lions, zebras, leopards, monkey, mountain gorillas, chimpanzees, jackals, spotted hyenas, antelope, and crocodiles among others. Set against a backdrop of towering volcanoes and mist-wreathed mountains, Rwanda is land of verdant rolling hills and plunging ravines. Studded with lakes, waterfalls and ancient forest, she boasts 200 species of trees and 300 species of orchid, many so rare they are undocumented. Rwanda is the cleanest country and organized in the whole of Africa. A community public cleaning of the country called Umuganda is done at every last Saturday of the months with all people including the president take part willingly without force. So, this makes it stimulating for travelers in Rwanda especially on this day since all businesses for all people to participate including tourists if they are willingly. The local language is Kinyarwanda, but almost all Rwandans speak a little of at least one international language. In rural, this is most likely to be Kiswahili, a coastal Bantu language. Most educated Rwandans who were brought up within the country also speak passable to fluent French but may not speak English. By contrast, many returned long-term exiles were educated in Uganda, Kenya or Tanzania or another Anglophone territory and don’t know any French but do speak fluent English. An ornithologist’s paradise, the country boasts 670 species of birds which in a country the size of Belgium is unprecedentedly highlights include the fabulous shoe bill stork and the elusive Great Blue Turaco. Africa’s first national park, the Volcanoes National Park protects the steep slopes of the Rwanda section of the Virunga Mountains, a range of six extinct and three active volcanoes that straddle the Ugandan and Congolese borders and protect more than half the global population of the mountain gorillas. A dense, green and misty realm it offers immeasurably ancient forests, massive stands of bamboo and crisp Afro-alpine moorlands dominated by giant Lobelia and Senecio plants. The park offers 50km of walking trails, tours of lakes and caves and a fascinating selection of mountain of mountain climbs. Tracking mountain gorillas is easily the most popular tourist in Volcanoes National Park. Of the approximate one thousand gorillas that remain on earth some two hundred live in the Volcanoes National Park. And so heavily protected are these shy and gentle creatures that only 8 tourists per day, per gorilla family are allowed into their natural habitat. The Nyungwe Forest is one of the oldest on earth, dating back to before the last Ice Age. Most famous for its 13 species of primates, Nyungwe is the place to see chimpanzees; acrobatic Rwenzori Colobus and the localized L’Hoest monkey. Visitors can also see forest elephants, giant forest hogs, otters, duikers, civets and some 300 bird species. This unique biosphere also offers 50kms of excellent walking trails that wind through forest, waterfalls and panoramic viewing points. 75km east of Kigali, Akagera National Park is dominated by a labyrinth of hippo filled swamps and crocodile-patrolled lakes. Across its savannah plains are impalas while predators include lions, jackals’ leopards and hyenas. As for the birds, this stunning realm offers 525 species including 40 raptors. Lake Kivu the largest of Rwanda’s many freshwater lakes is one of its only three exploding lakes due to gaseous volcanic activity. Ringed by wooded hills and fringed by white sandy beaches and sultry hot springs, it offers lakeside resorts, water sports and island tours while the towns of Gisenyi, Kibuye and Cyangugu excel in leisure, dining and accommodation options. Walking, boating, fishing and rural village tours are also offered on many of Rwanda’s other 22 lakes. Rwanda’s attractive capital Kigali ranges over several hills. It offers a world class range of hotels, restaurants and bars and is one of the best places to experience the extraordinary spectacle of the Intore Royal Ballet. Also in the city is the world famous and exceptionally moving Genocide memorial centre, a permanent exhibition documenting the tragedy of the 1994 Rwanda Genocide. Traditionally the sons of the king’s noble men, the Intore dancers were originally based at his court in Nyanza where they performed for his pleasure. Music and dance are an integral part of Rwandan ceremonies, festivals, social gatherings and storytelling. At that time their dancers depicted only war but today, clad in leopard skins and Colobus monkey capes with bells around their ankles, they perform a series of rhythmic pieces, the most famous of which is the Crane Dance. Must-buys in Rwanda include pottery from the Twa (pygmy) people, basket were, wood carving, bead work, jewellery, masks, musical instruments, banana leaf products, batik, locally woven fabrics and candles made from local beeswax. Accommodation options in Rwanda range from five-star international hotels to dingy local guesthouse, and prices vary accordingly. The main concentration of high-quality accommodation is in Kigali, but there are also facilities to international standards in and around Volcanoes, Nyungwe and Akagera national parks and the Lake Kivu resorts of Rubavu/Gisenyi, Karongi/Kibuye and Ruzizi/Cyangugu. Accommodation options are categorized in exclusive/ luxury, upmarket, moderate, budget, and camping. Rwanda can be visited at any time of the year. The long dry season, June to September, is the best time for tracking gorillas in the Volcanoes National Park and for hiking in Nyungwe Forest National Park, since the ground should be dry underfoot and the odds of being drenched are minimal. This should not be a major consideration for any reasonably fit and agile travelers unless they are planning to hike to Virunga peaks such as Bisoke or Karisimbi, in which case the rainy season is best avoided. The dry season is also the best time to travel on dirt roads, and when the risk of malaria is lowest.